India apparently plans to force the holders of green energy patents to license their innovations to Indian companies. As we noted earlier this week, this seems a bold extension of a policy that has already had a limited use in the health and pharma sector. India can do this under the National Manufacturing Policy. The NMP says that the government can invoke compulsory licensing on green technologies or cutting edge nano-technologies if the patent-holder is either unwilling to voluntarily issue a licence or if the licence-seeker is unable to bear the ‘high cost’ of royalty or if the royalty demanded is ‘unreasonable’. A US patent blog has warned that this policy could be used to take control of incremental technological advances as well as breakthroughs. So much for the expensive American consultants who promised big pharma that they could focus serious US efforts on getting India to respect the global patent regime. This very helpful summary from the Indian Embassy in Washington shows that pharmaceuticals ought to be an area where the US can bring some pressure to bear: if you discount the trade in precious stones (an oddity). pharmaceuticals come second only to textiles in the value of Indian exports to the USA. 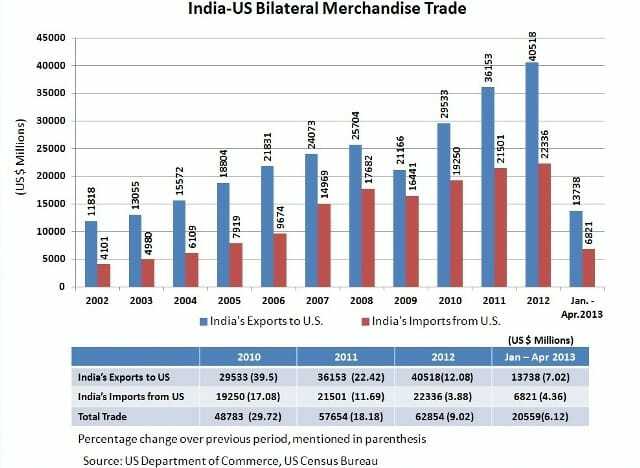 There is, overall, a vast (albeit shrinking) trade surplus for India in its relations with the USA. Those consultant fees and first class airfares probably don’t count as money well spent. India’s oldest financial newspaper, The Financial Express, has a provocative editorial today headlined, “What’s Yours Is Mine”. It concludes, “while it is understandable that the government would want cutting edge technology to help better the lives of millions of people, green technologies are subsidised by governments the world over, surely India can do the same? The other issue that gets missed in the debate against patenting of new medicines also is that many of the companies developing new technology are increasingly going to be Indian. So it is no longer just MNCs whose products are being ripped off. Any slowing in innovation as a result of this can only hurt the very people whose interests are being sought to be protected.” The Financial Express has always been pro-free market and led the campaign to support de-regulating India’s economy. Still, it’s strong stuff.